One week ago everything I knew about the Atari ST could fit in this sentence: “The Atari ST was a computer.” The past week I have studied it and have built the knowledge required to start programming on it. Follow me and I’ll show you what I learned. I will show you how to write software in 68k assembly on one of the iconic computers of the 80’s. 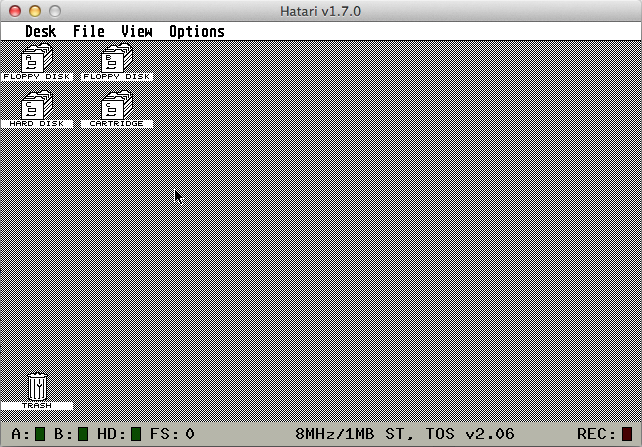 You didn’t think we were actually going to program on a real Atari ST did you? Who has room for that sort of stuff? Apparently not us says my wife. 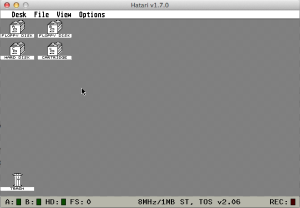 For this tutorial we are going to use Hatari. I didn’t shop around, but this emulator seems pretty awesome. I recommend it. 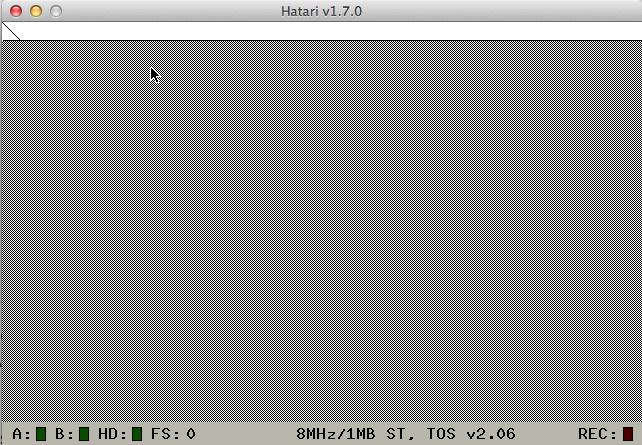 If you are on Mac OS X it’s easy to install with macports (‘sudo port install hatari’) and on Ubuntu it should be in apt-get (‘sudo apt-get install hatari’). Macports gave me a valid bootable install that runs EmuTOS (a free replacement for Atari TOS), but Ubuntu gave me an install that can’t boot because it can’t use the EmuTOS image. Don’t worry about that, we are going to use the easily obtainable Atari TOS anyways. Maybe everything works with EmuTOS, I don’t know I didn’t try it. *High-Five* now your system is setup and ready to get the dev tools going. For this bit we are going to use the assembler called DevPac3. I’ve heard TurboAss is good too (giggle), but I found more resources talking about DevPac3 thanks to the Demoscene. The version I’m using is DevPac 3.10 by HiSoft. Finding it shouldn’t be difficult with an internet search. 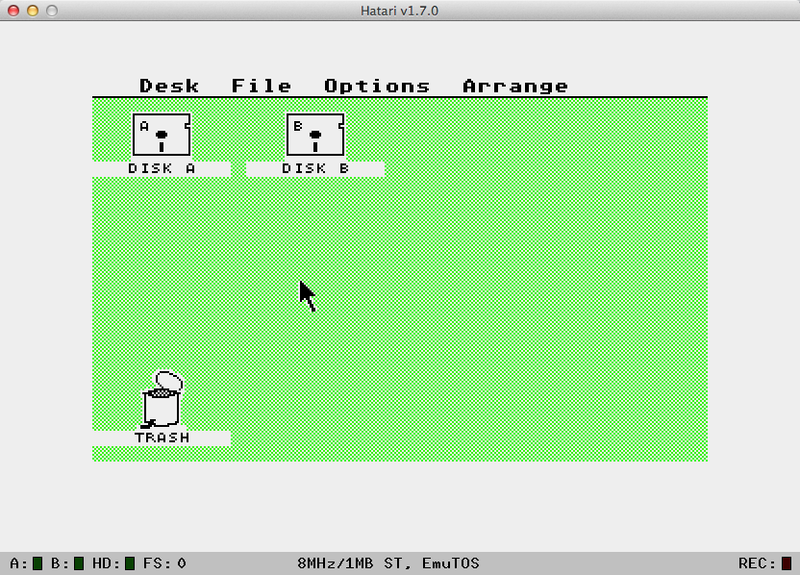 If you find it as an “.st” file you are in luck, that’s a floppy image, you can skip the next section. If you download Devpac and it comes as a directory of files: You could try to be a wiseguy and drag the files to your directory you selected as your hard-drive then run DEVPAC.PRG from there like I tried, but you’d be wrong! (maybe). My installation was giving me troubles because it wanted to be run from the floppy drive. You may get errors when starting DevPac. 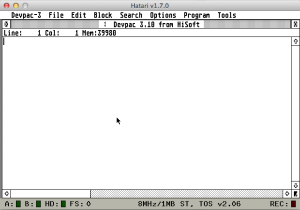 In this case, go into the Hatari settings (F12), then go to ‘Floppy disks’ and make a new floppy image, put it into a floppy drive, then drag your DevPac files into that floppy disk and run DEVPAC.PRG from the floppy from now on. Your default settings for DevPac should be good. There is just one thing we want to make sure is set. If you go to Options -> Control… make sure that Format is set to “ST RAM” This is going to make it so that when we assemble it puts the code straight into memory so we can execute it directly. 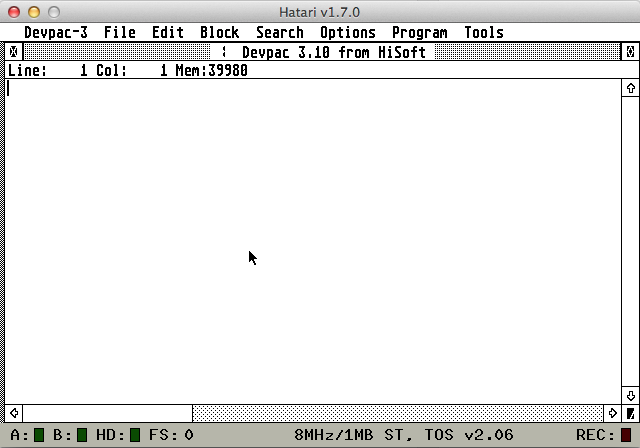 Another option that will be useful later is selecting “Atari executable” which will be necessary to make a PRG file. You could always just save this code to disk in your hard drive folder then load it from DevPac but then you would miss out on the satisfying clicky sounds that the Atari ST makes while you type. Whoa! Watch out, don’t get angry! We actually did something, look in the top left-hand corner… no closer, look there is a diagonal line there! We did that! Okay, you are right I should have warned you at the beginning of the article that the program was lame. But it is understandable and digestible for a first program. Press any key to exit once you are done soaking in the wonderful line. Here is a quick rundown of the code. In the first section of the code we are just creating aliases to offsets and commands. All of those constants I got from the Atari ST Internals book [see references]. Next we jump to the subroutine (jsr) initialize which sets us up for Super User mode. I didn’t actually test to see if Super User mode is required for the demo but why not go Super, we can handle it. When initialize returns (rts) we are going to call Line A init. Line A is the package of drawing calls we are using. There are other ways to draw on the Atari ST. I think these are the fastest least portable graphics calls (any greybeards to correct me?). The weird thing about that call is that it is happening with the dc command which is just putting that data directly into our code instead of using some sort of call opcode. If you check out the documentation for init you’ll see that it sets up register a0 with a struct we can edit to set parameters to other Line A calls. We do that in our next section to setup the parameters to the draw line function. Then we finally call the draw line function on line 35. Then we are going to use a GEMDOS function to wait for a key press (function 7 of the GEMDOS which is trap 1) on line 37-38. Now that we have a keypress we are just going to restore User Mode, then call the GEMDOS exit function on line 42. In some ways Atari ST development is better than the development I do today for iOS. In other ways its a bit clumsy. A dark shadow falls over me when I think about all the hours of work spent by Atari ST engineers to build something almost lost to oblivion. The silver lining is the amount of love that still exists by a select few fans of the Atari ST. I can’t help but think about the similarities between software development and Sand Mandala. Maybe I’ll get around to figuring out how to do animation next, we’ll see.